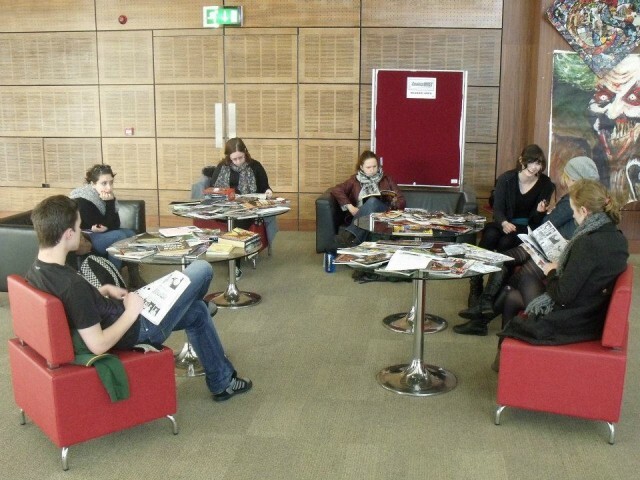 A fairly new comics convention is NUI (University) Galway’s ComicsWest. 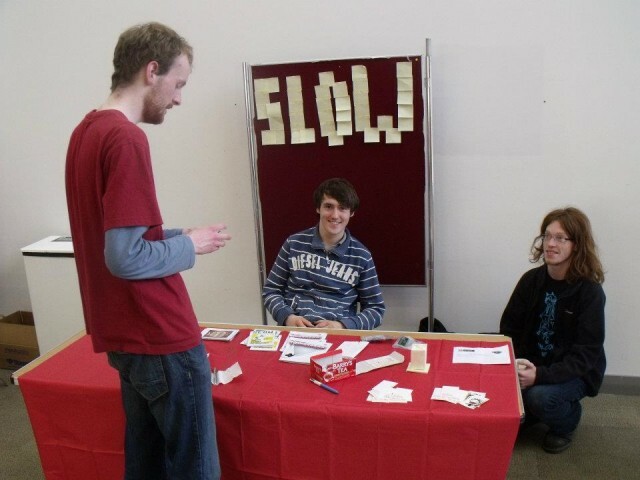 Organised by one of the biggest societies on campus, the event had a trial run last year and a visit from Warren Ellis in Spring. The best way to get there is to let Paddy Brown drive you, through the natural monument range of Sligo. The stuff, as he said, you can’t do justice to on film. The train journey can be quite pretty, but I’ve no info on planes. Warren Ellis cursed, but he does. Galway is a long oul run. Nice to see David McDonald there too, who I owe £3 for the Doomlord collection. Colm McElligott (Committee Host), Conor Keville and John Smith at ComicsWest. Next, Some people are engrossed by our comics, some reckon it is the best cake anywhere in Galway. My long-suffering giant, Paddy Brown, mans the fort. 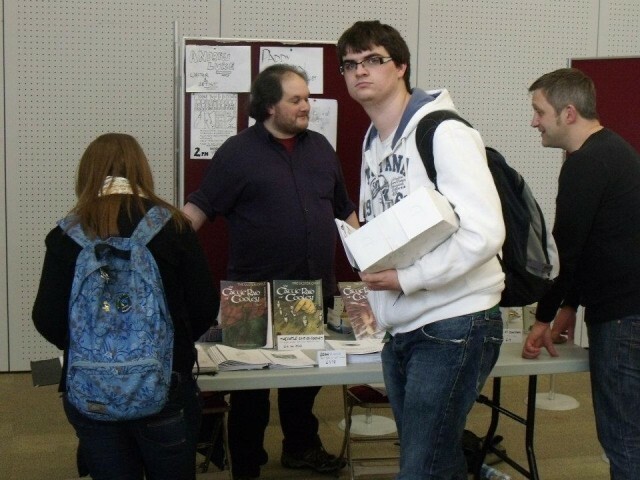 And that might be Hibernia Comics’ David McDonald to the right. Tea and coffee was on tap, and more provided biscuits than mankind was meant to have. The Society’s reading library was laid out on five tables surrounded by plenty of comfy chairs and lent a nice atmosphere to the occasion. Out back an animation suite had a few animations playing, and a live screening of The Invisible Artist, the film I wrote with Carl Boyle about forty years of Belfast comics creators. (It’s not online until next year, but if you wish you can buy a copy now for £10-£15 from Northern Visions’ website.) The video room had been the locale of the pre-event gathering, and the reminder that the 1960s Batman movie was actually….bloody awesome. Jim Carrey’s Riddler written by Janet Scott Batchler? No. What weighs six ounces, sits in a tree and is very dangerous? A sparrow with a machine gun! Yes, of course. Frank Gorshin, Lorenzo Semple Jr., Bob Kane. I hosted a piece on Writing for Comics in the art room upstairs. Followed with organiser David Burdon presenting a joyous piece on Science and the Superhero with some scrutiny on propaganda for good measure. Organisers confessed the event could have been better promoted, foot-fall was decent. Few hours dinner break didn’t harm pm panel attendance noticeably. So Mike Carroll, Maura McHugh, Paddy Brown and I sat taking questions from Eoin Butler Thornton and possibly Leigh Ashmore. Very relaxed, very interesting, one of the better panels I’ve sat on. Sure, they all read 2000AD for girls while I preferred adult comics like Transformers, but we had the flow of a symphonic jazz quartet. Someone made cookies. ComicsWest is set to be one of Ireland’s great cons of the future. It’ll quickly gain the reputation that 2d, Hi-Ex and Caption have for prog innovation and I’d posit the reason for this: the event is well laid out, the people are very pretty and the organisers work well as a team. Very well. 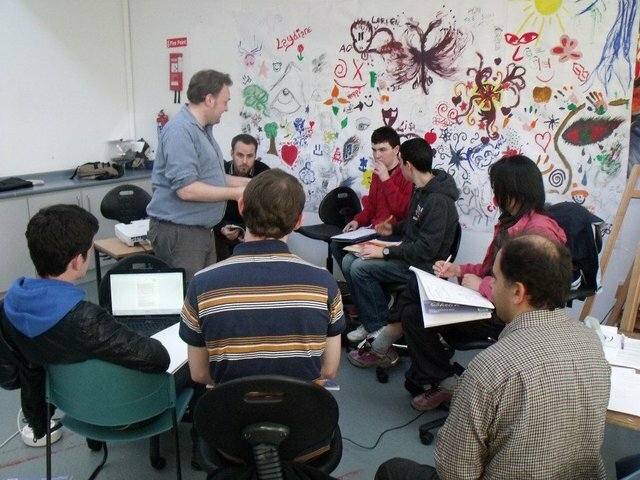 The university supports them, the social chemistry is gold, and the attendees are involved. There is of course a post-script to this, but for all intents and purposes, my con report is done. We must go next year. The social connect was evidenced by me the night before in the bar. I educated the kids on the greatest superhero fight ever: Batman Vs Green “One Punch” Lantern. Eoin and I bonded over shared love of The Wire, and as a guest they were in awe of, I got some free reign to slag off Battlestar Galactica. I’d elected to spend the night in Colm’s free cot. An option that was curiously unavailable the following night after he disappeared from the pub and there might have been some girl involved I’m not sure for no verification documentary evidence is available but at least he got shome. Item A, the empty bottle of Southern Comfort, has now been removed. It was drank by myself, Leigh, Eoin and a third committee member as we spun yarns and shared declarations of mutual awesomeness in a house in the hills. Paddy managed to find me the next morning, and drive me to the emergency Breakfast Shop and all the way home. So, plan out your trips to festivals be a lesson. Because they might just be too fantastic.